People: Amen. O Lord Jesus Christ, you have promised that, wherever two or three are gathered together in your name, you will be in their midst. Look down upon us with love and compassion as we assemble before you to honor your Sacred Heart and to make it known and loved by all. Come into our midst, O Jesus, fill our hearts with your blessings, and inflame them with your love. Priest: O Jesus, answer our petitions as we kneel before you. People: O heart of Jesus, hear and grant our prayers. O Lord Jesus, you have said: “Ask and you shall receive, knock and it shall be opened to you.” Grant, we pray that with all our heart, words and works we may love you and never cease to praise you. Amen. People: O Heart of Jesus, hear and grant our prayers. O loving Savior, infinitely generous, seeking only our interest, from your Sacred Heart came those words of pleasing love: “Come to me, all you that are burdened and I will give you rest.” Relying on this promise of your infinite charity, we come to you. In the lowliness of our hearts, we earnestly beg you to grant us the favors we ask in these First Friday devotions. If what we ask is not for the glory of God or the salvation of our souls, grant us what is conducive to both. People: O Heart of Jesus, hear and grant our prayers. O almighty and eternal God, look upon the Heart of your dearly beloved Son and upon the praise and satisfaction he offers in the name of sinners and of those who seek your mercy. Be appeased and grant us pardon in the name of same Jesus Christ, your Son, our Lord. Amen. Lord, have mercy on us, Christ, hear us. Christ, graciously hear us. God, the Father of Heaven R/. Have Mercy on us. Heart of Jesus, in whom the Father is well pleased, R/. Have Mercy on us. 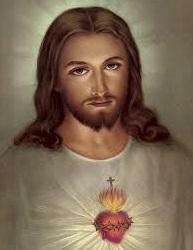 People: Adorable Heart of Jesus, glowing with love for us and burning with zeal for our salvation. O heart ever sensitive to our misery and wretchedness to which our sins have brought us, and infinitely rich in mercy: behold us kneeling before you to express the sorrow that fill sour hearts, for the coldness and indifference with which we have for too long repaid the numberless benefits you have bestowed on us. With a deep sense of the outrages heaped upon you by our sins and the sins of others, we offer solemn reparation to your most sacred majesty. We resolve for the future to love and honor you more and more in the adorable Sacrament of the Altar. We resolve to assist at Mass with more devotion, to be more careful in our preparation for Communion and more fervent in our thanksgiving. We intend to do all in our power that the Blessed Sacrament of the Altar may be better known and loved. O Sacred Heart of Jesus, be our mediator with the heavenly Father. Strengthen our weakness and confirm our resolutions. Make us love you more and more, and grant that nothing in life or death may ever separate us from you.